She should have just slapped me in my face or yelled at me because I believe I could have handled that much better. She doesn’t understand that I visit three different sizes often. Because of this I must have something to put on when I go there (LOL). Every time I tell them I’m not coming back anymore they laugh at me just like some of you are laughing right now. After two days of purging my closet, as Tam calls it, I had so many bags of clothes and shoes that I knew I would never wear again. However, that did not stop the withdrawal symptoms. When I would lie down I would think about certain pieces to see if I wanted to go and take it from the bag. The night sweats I really couldn’t distinguish from age 50 or my clothes but I can say I had a little more than usual. I have one piece that I brought about two years ago and have never worn. I know it would look so cute on my sister Karen and I laid it on the chair to give to her but for some reason I have not given it to her yet. Mind you she was here helping me purge my closet. Yes she was here and the jacket stayed here. I was trying to see if I wanted to change my mind (LOL). To me it was like I let it go because I took it out of the rotation pile but really I didn’t. I kept it close by in case I wanted to put it back in the closet. After four days of strolling pass the nice jacket on my chair God begins to speak “Why are you holding on to this?” Those words were the only words I needed to hear. You see it was not about the jacket. God doesn’t care about any material stuff you want to keep unless it keeps you from Him. In my case it doesn’t keep me from Him but I immediately started to inspect my life which includes: my attitude, my temperament, my possessions, and also my friends. Many times we hold on to things and people because of sentimental reasons. Those things and people will began to clutter our lives so much that we can’t even see the jewels that are buried in us. Like you have held on to a nasty attitude for so long just in case someone gets you wrong you won’t have to go to far to find it. How about the toxic friend that hogs all your time so you can’t explore new relationships? My mom called it spring cleaning when we were growing up and we didn’t like it because it was very detailed cleaning. It was a lot of work but at the end of the day when the work was done the house was clean and fresh. Remember if you don’t get rid of the old ways the new ways won’t grow. Awesome word Dr. Dee Dee! Thank you so much, this just blessed my life. Amazing, l do that a lot. Lord help me!! Yesss just the word I needed for my currently process thank you. This Is my first time replying even though I read and appreciate your posts. My Agenc’s Regional Administrator has asked the ladies here to do the same. We are helping women who will be going into the work force for the first time or returning and need professional attire & accessories. Thank you for being that Godly example. This was so good to me! It really hit home for me when you tied in the toxic friends hoarding all your time, wow. It’s really got me thinking. I love, love, love this week’s blog! Thank you Dr. Dee Dee for that timely word and the life,application this is attainable to me. I receive this and will apply in my life now. Thank you for that word of wisdom and encouragement. Now application can be performed. I needed that push in some other areas that I did not want to commit myself to purge in but now that the word has been sown,I must be obedient. Thank you for that word. This was sooo good Dr Dee, I’m about to do some purging too! Dr. Dee Dee this was right on time, thank you for confirming what I really knew and was just not ready to let go. Good post Dr. DeeDee! I receive this God-inspired information. God bless you! I LOVE this!!! & this is what I currently set my mind and heart to do. Love you Dr.DeeDee!! LOL. This is so on time. I’m on Spring Break and purging clothes is my single project this week. Thank you for sending the on time word and confirmation. Thank you Dr. DeeDee. Needed this message today as I begin my purging! Dr. Dee Dee, thank you so much for that word I so needed to hear that. I have to began to clean and purge so I can become more productive. Yes I do this all the time; I don’t like holding on to “stuff”…….I like order and I let it go! 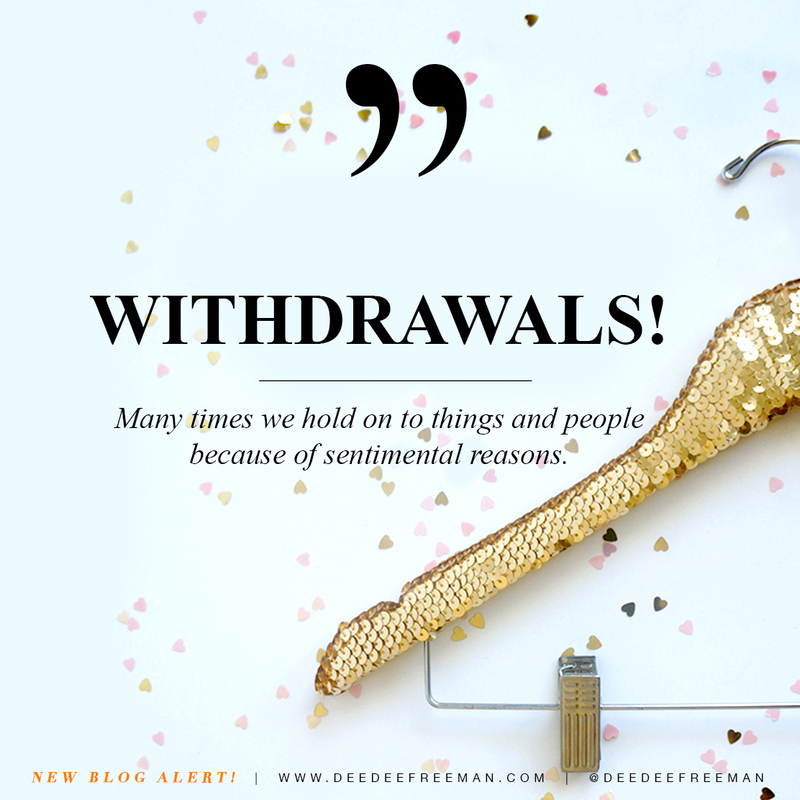 Purging not only of clothing but of negative thoughts, persons, and places! Insightful, however here is my challenge if we don’t keep people and things for sentimental reasons then what would be our reason for making connections at all? I guess this would be my homework, what are my reasons my making connections and/or should I put too much weight to those connections. Wow. I really need this blog on this day…..gave me a lots to ponder over and also act on , Thank you so much for posting. Wow! I really needed to hear this. of holding on to things that I should have gotten rid of. Thank you for posting this blog….wow! I love this, some times we hold on to memories that holds us to some unpleasant memory of a horrible situation that we should have been let go…. I do spring cleaning every year faithfully to MY home but I really never thought about ‘spring cleaning’ for my life. It’s time to purge some people, things I’m holding onto and especially the bad attitude from a hurtful divorce. Yaaaas! This was so spot on Dr. Dee Dee!!! Thank you Dr. Dee Dee for this post. I, too, am guilty of hanging on to things (and people) that are no longer necessary in my life. I think that my hesitancy comes from me fearing that I won’t get the “new” once the old has been purged. I now know that I must have faith that the new is already on it’s way and God is just waiting for me to have an empty hand to receive it. I am purging people and things from my life. “Why are you holding on to that” spoke to me regarding feelings I was having that I’ve since purged as well. Let it go, I get it…. This is so Awesome thank you I was and still doing spring cleaning this week. So on time! Thank you! I smiled…I visit three sizes (regularly)too! You are a good writer…your writing flows.